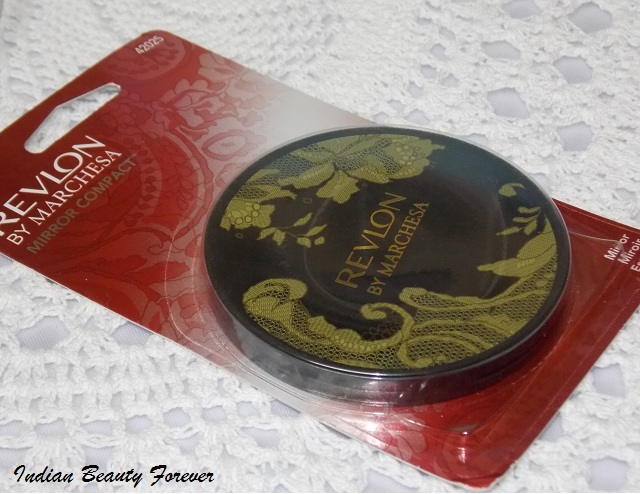 Recently, Revlon India launched a couple of new products, like Colorstay shadow links and a couple of beauty tools like compact mirror, nail files, appliques etc which you may have seen in the event post that I had published a couple of weeks ago. If you missed the Colorstay shadowlinks swatches then click the link to check the cute, tiny customizable pans. 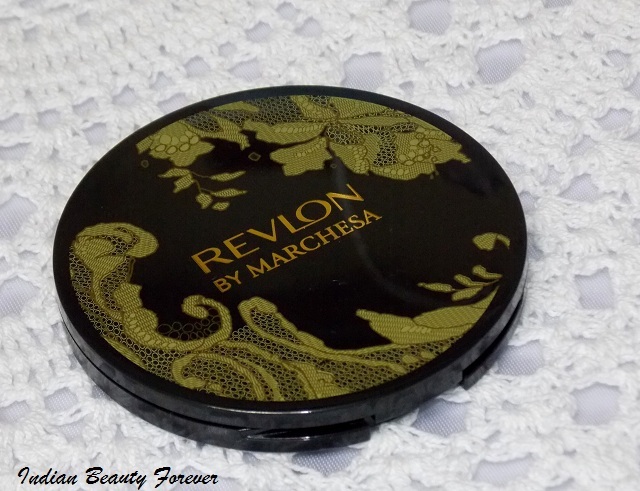 Today, I am going to review the limited edition Revlon By Marchesa Compact mirror. 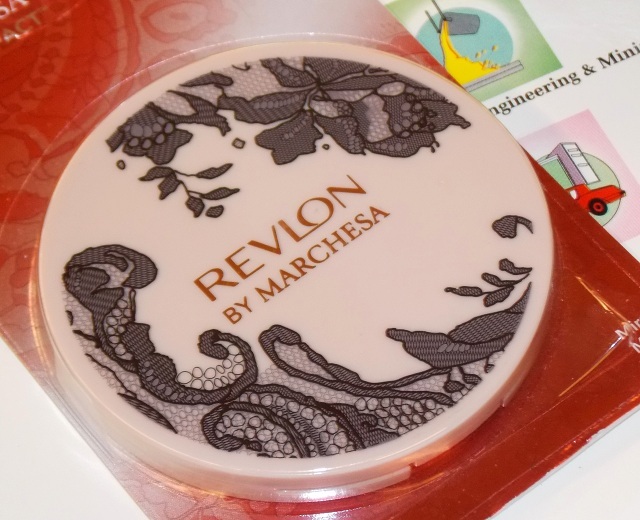 It’s being named as Revlon By Marchesa since the intricate lacy design over these compact mirrors are inspired by the Marchesa dresses as seen on the spring/summer 2014 Runway. 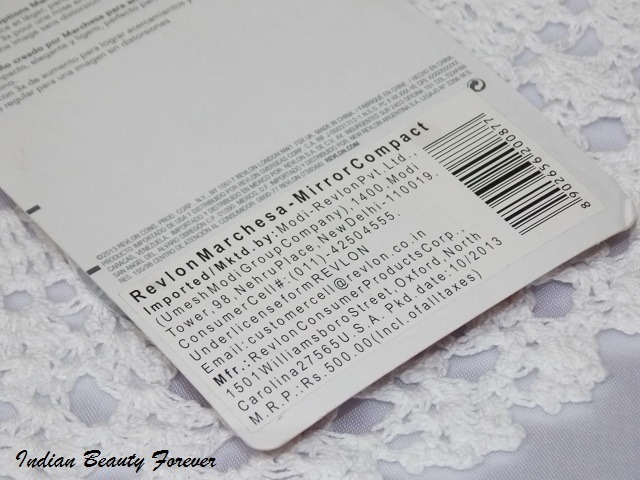 Price: These gowns oops the compact is priced at 500 rupees. As of now, I haven’t seen them online yet. These beauty tools have been launched in two colors, a beautiful timeless black with gold detailing and a beige with black lacy design. I have got other tools in the color beige but the mirror I got is black, though I wanted the beige one. It looks classy! 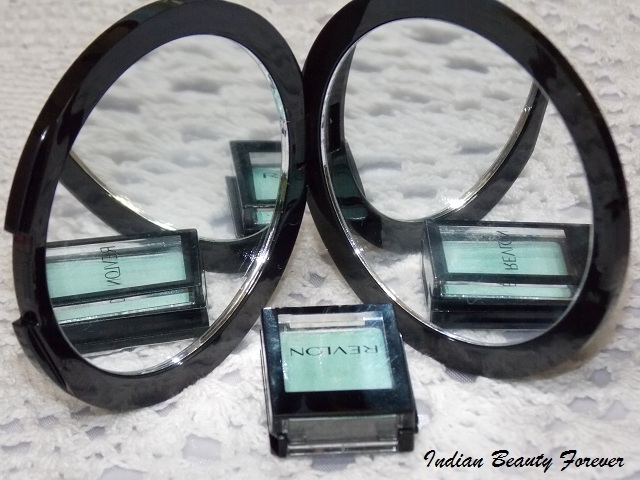 The compact Mirror is a very slim and compact dual sided mirror with a diameter of around 3 inches. It’s sleek and compact design let's you slip easily in your bag. The upper part of the mirror has an embossed lacy floral design that is enticing and looks beautiful, just like the Marchesa dresses. The other side of this product is just the plain black. Inside, you’ll find two opposite facing mirrors, out of one is a regular plain mirror while the other one is a convex mirror that enlarges the regular images. 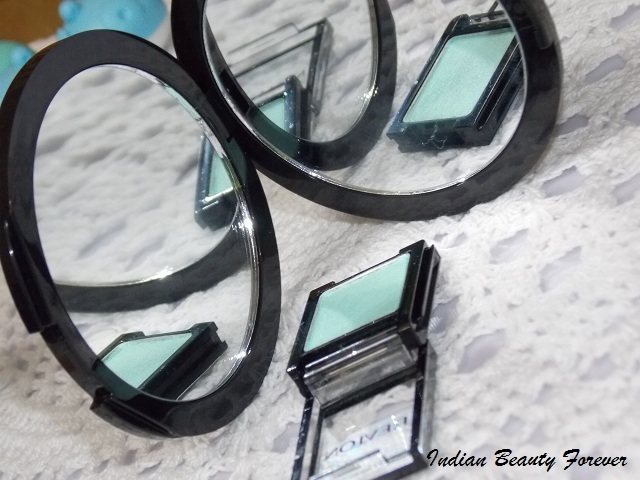 I find this mirror to be very helpful especially while tweezing my brows or even applying eyeliner. In the pictures, you can see, I kept Colorstay shadowlink in between both the mirrors and it clearly shows that in one of the mirrors, the pan looks bigger. No surprise!! Do you want to see how the beige one looks. I clicked the picture of that one while I was at the event. 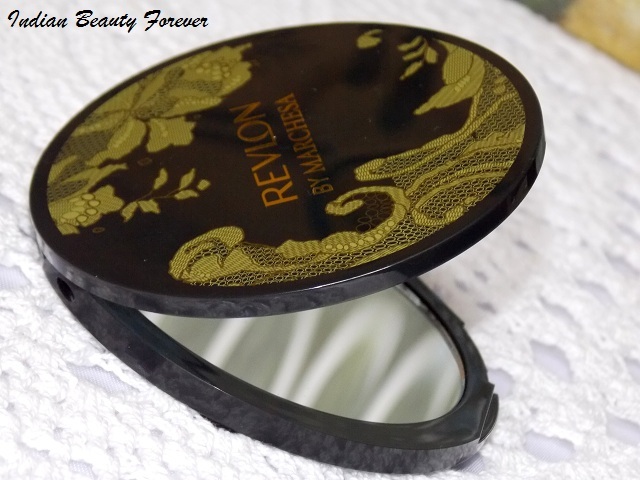 At first I thought, 500 bucks for a compact mirror is slightly higher but after knowing that it has a magnifying mirror, I felt the price is justified more or less but not to forget the beautiful black and gold embossed design which is elegant and chic! Rest I will leave it on you wheather you're willing to spend that much on a mirror. The outer body is very hard and sturdy that leaves me worry free as it’s not going to get damaged easily or get cracked. The only thing I felt was the image in the magnifying mirror is slightly low on clarity that can be explained by the enlargement of the image. But I felt that, so mentioned it! 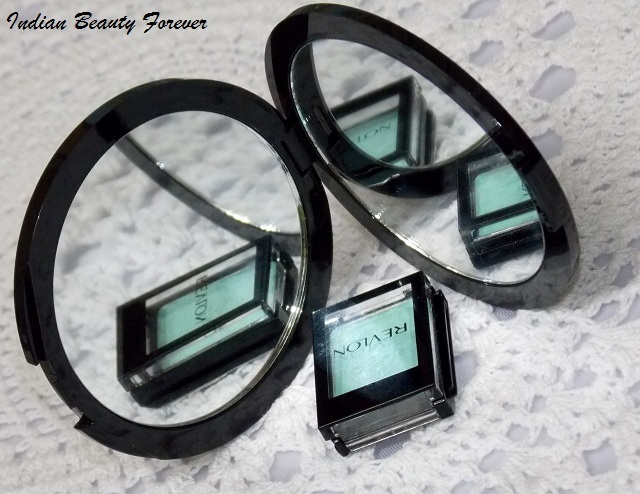 apart from that I really couldn’t find any flaws in this product since it’s a compact mirror meant to be kept in your purse for regular touch ups and the magnifying mirror makes it even more useful while tweezing, eyelining or any which way you want to use it, thus, it serves the purpose well. I wish price could have been slightly less. 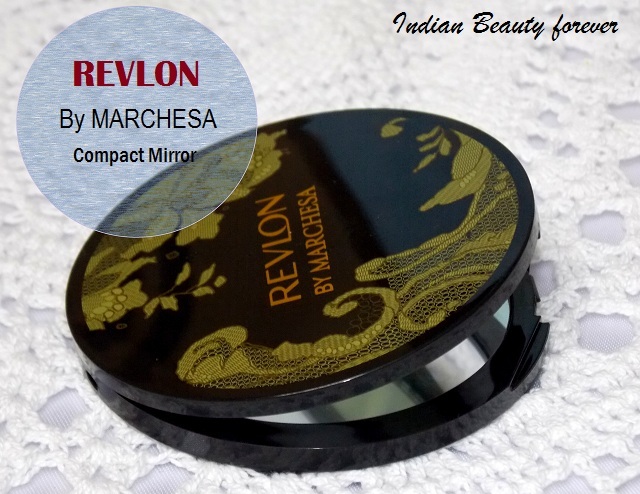 Take- If you are looking for a good, chic compact mirror especially with a magnifying mirror then you should definitely go for this. PR sample, given for consideration!